My aunt recently sent an email to my extended family inviting everyone over for “amazing tomato soup you don’t want to miss,” or something to that effect. Well, I didn’t want to miss the soup, but I had no choice since I live nowhere near any family! I knew I had to eat this soup one way or another. Thankfully she shared the recipe, saving me a few hundred dollars in airfare. This Tuscan Tomato Soup is very yummy. And easy to make! Quick disclaimer before you start thanking me for sharing a healthy recipe to complement your New Years diet resolutions. Um, yeah, there’s cream in it. But cream has protein and calcium, right? Are you with me, health gurus? Heat oil in a medium large soup pot. Add onions and cook over moderately low heat until completely translucent. Add tomatoes and allow to warm to a simmer. Add chicken stock. Bring to a simmer and allow to simmer for 15 minutes to allow for interchange of flavors. Add whipping cream. Add pesto. Blend to desired consistency in a food processor or blender. (Barbara reserves a little bit of the soup un-blended so there are some chunks.) Adjust seasoning with salt and pepper. This looks so good, I will put it on my list, I make a Tomato Soup that is similar but I add cream cheese instead of whipping cream and I haven’t tried it with the pesto so I will definitely give this a shot. Thanks for the recipe. shannon – I emailed busymom3 to find out her answer! 🙂 stay tuned! I cook it low and slow to disolve the cream cheese as much as possible stirring with a whisk and the finish it off by using the emersion blender. 1.5 Cups Heavy Whipping Cream??? ay, ay, ay, you’ll shoot your eye out kid! Pesto is a nice added touch. This sounds really good and I love receipes with only a few ingredients for this working mom. Mmmm … looks great! I like all of TJ’s pestos, by the way. Last week, we tried the lemon artichoke variety and it was delish. My husband couldn’t get enough of it. Unfortunately, it’s a little high in the calorie department, so it will only occasionally be gracing our table. This really does look fabulous! 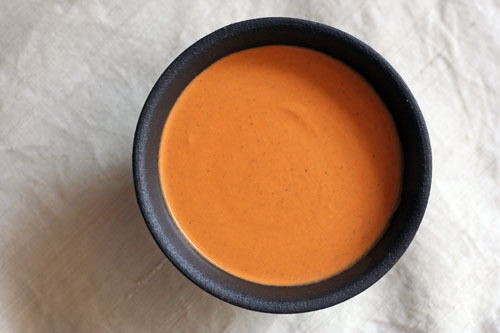 I need to start making these Tomato Soup.Thanks! Oooh, this looks yummy. And just in time to redeem tomato soup in my eyes. Over the winter break I had some Campbells Tomato Soup and it was so bland. Have my tastebuds changed or have they revamped their recipe? I had to add garlic, salt and pureed tomatoes to give it any flavor at all. So this looks yummy. And I won’t be lazy and just open a can if I can look forward to this. Chef’s Table is our favorite fancy restaurant. I’ve never eaten anything there I didn’t LOVE. Sounds fabulous. You can always use evaporated milk in place of some or all of the cream. I’m definitely making it this week…or next week! I found a recipe for roasted tomato black bean soup over the weekend to try as well. I may over dose on lycopene! evaporated milk, what a GREAT idea collette! so glad you commented. if that tomato black bean soup is good, send me the recipe, please! This soup is truly and wonderfully delicious! The cream and the pesto just takes this to a whole different level. oh yum. Made this and it was a HUGE hit with my family. My mother kept telling me it was Damn good!!!! 🙂 LOL! This was a delicious soup! It was one of the course request by the bride of a wedding I catered on a small charter boat. I garnished it with creme fraiche and fresh julienne basil. It was a hit! It is definitely going in my “favorites” notebook. Thanks for your delicious recipe! I made this tonight for my family and everyone loved it! Thanks for the great recipe. I LOVE this soup recipe and was hoping it wasn’t as unhealthy as the cream makes it appear. Calories aren’t horrible. It’s the fat content that gets you! 369 calories (assuming the recipe makes 8 large servings) but 34 grams of fat! Ouch! Unfortunately, it’s so delicious, I’ll eat it anyway!! On the point about how to add the cream cheese so that it mixes in without little lumps, I now microwave the block of cream cheese just enough (on medium power) to make it soft & a bit melty, then add it. It mixes right in with a little stirring without those little lumps. I am making this tonight with grilled cheese! YUM! Made tonight and it was super yummy! I actually added some diced carrots and let them simmer with the soup to add another vegetable. When purÃ©ed, didn’t even notice they were there. I also substituted fat free half and half for the cream and it worked great! those are great modifications, thanks for sharing. glad you enjoyed the soup! Recipe was great! Made it Monday and it was a huge hit! I actually added a little cheddar cheese (just a smidge, I swear) and I felt it tasted great! Either way you make it, this will be a keeper. I made Grilled Cheese Croutons (grilled cheese sandwich cut into cubes) and floated them on the top! It was WONDERFUL!!!! You can now buy cooking cream cheese, made for blending into soups etc, for anyone wanting to go that route. Made by Philadelphia. I’m making this recipe tripled this week with turkey and goat cheese paninis to serve on a winter cabin getaway after a long day of cross country skiing. Yum! great tip! will have to keep an eye out for that! I just ate at Chef’s Table again two days ago, where I had this soup. I got home and had to figure out how to make it, and came upon this site. -I used a full pint of heavy cream. 1.5 cups just wasn’t enough to give it the same richness. -The recipe definitely should include some sugar to balance out the acidity, especially if you used canned tomatoes. I used about 2-3 teaspoons of sugar, maybe a little more. -The restaurant version also includes some asiago cheese. While not necessary, it boosts the flavor a lot. I probably used not even an ounce, finely shredded and mixed in. -Classico-brand pesto is SPOT-ON for the taste. Seriously. I wouldn’t be surprised if they used this canned stuff instead of making it fresh. The look and taste match exactly what I had at the restaurant. Other than that, great recipe, and thanks for putting it out there. THANK YOU for commenting! so great! Has anyone made this in a vitamix without cooking it on the stove first? I haven’t made soup in mine yet but I’m dying to try it. Any tips? maybe others will chime in, but thought I would respond. I have NOT tried that with this particular recipe, but given the ingredients involved, I think this could be a good candidate. I think there won’t be quite as much depth of flavor, since the soup won’t simmer for a time. But I also think it could still be tasty! I actually have only tried make soup in my blendtec (the same thing as vitamix) once… https://thisweekfordinner.com/2009/08/25/blendtec-total-blenderim-in-love/ I found that while the soup heated up, I still wanted it hotter. I have yet to try it again, but I know people do use this method and like it! This sounds delicious! How many does it serve?